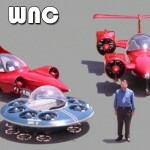 You are here: Home / Where’s Your Flying Car? Right Here. Where’s Your Flying Car? Right Here. Growing up in the 50’s and 60’s were exciting times for smart kids. They were faced with endless possibilities. Man hadn’t just found the atom, he’d harnessed it. Man didn’t just sail the oceans, he”d driven nuclear subs to depths never before imagined. Man didn’t just go to the moon, he walked on it. Man could do anything his imagination could conceive. Pop culture reflected that. From the liberal fantasies of Star Trek to the conservative preachings of Heinlein, there was no way for mankind not to bend society, and the world it was on, to its will. But none of those dreams seemed to capture the psyche of the time like the Jetsons. Every week George packed his family of cliches into their flying car and had a new adventure and everyone, and I do mean everyone – from the poorest of the poor to the richest of the rich, wanted that damn car. It isn’t like we got gypped in the deal. From those dreamers came (in no particular order) the Internet, cellular phones, fuel efficient engines, solar power, satellite technologies, the artificial heart, every film special effect you’ve ever seen, the space shuttle, surround sound, low fat anything, You Tube, and on and on the list goes. In fact there have been so many innovations that we are still trying to sort what we can do, Hello Monsanto, from what we should, Goodbye Monsanto. 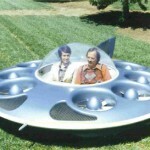 Despite all that, ask anyone of a certain age what they miss and they will, invariably, bring up that damn flying car. 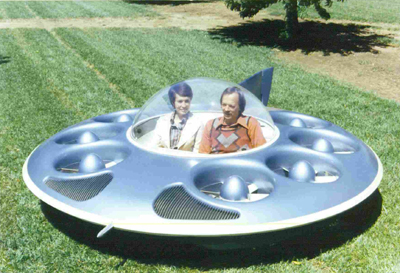 Well, Paul Moller felt your pain and spent most of his life trying to make a flying car that works. Now he has three and they are going to be mass produced. Moller International Inc., the Davis-based maker of flying cars, may see commercial production finally take off in China. Moller (OTC-QB: MLER) says it has a signed memorandum of understanding with Athena Technologies Inc. of Harbor City in Southern California, agreeing to create a U.S.-based joint venture to set up co-production for its aircraft in the U.S. and in China. Under the provisions of the memorandum, Moller will jointly produce numerous models of its vertical takeoff and landing aircraft. The joint venture will initially invest $80 million of a planned $480 million with the objective of producing a variety of VTOL aircraft by 2014, Moller says. 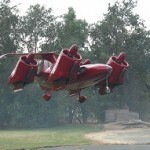 Production will include the Skycar 200 LS, Skycar 400, Skycar 600 and Neuera aircraft. Moller is to retain its intellectual property while providing the joint venture with aircraft designs, ready-to-install Rotapower rotary aviation engines, and the requirements for the airframe and flight control system hardware to be produced in China. The joint venture is to provide all necessary production funding, purchase a 35 percent ownership in Moller and provide Moller with 25 percent fixed ownership in the joint for a period of 10 years. “The formal agreement is expected to be approved by both parties within weeks and lead MI and its JV partner to becoming world leaders in personal airborne transportation,” says Paul Moller. Bruce Calkins, Moller’s general manager says the partnership leverages Moller’s knowledge of VTOL aircraft design with the cost-effective assembly and manufacturing capabilities that can be carried out overseas. “Our objective is to become the market leader in this form of personal aviation, and with this agreement we are in a great position to achieve that goal,” he says. “We are very affirmative and optimistic about this JV opportunity. Moller’s VTOL technology certainly is the very best in the world and we are looking forward to building a first class VTOL airplane factory in China,” says John Gong, chairman of Athena Technologies. 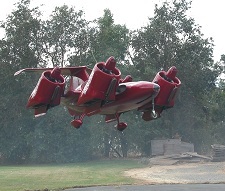 Meet the Neuera aircraft. That saucer shaped beauty to the right. They can fly over any terrain, can carry a wide variety of pay loads and have captured the interest of law enforcement officials the world over. Border guards, jungle police and many others see this as a viable alternative to, if not a flat out upgrade over, off road vehicles. Additionally, it can easily be weaponized which means the officer could stay in the vehicle when confronting a threat. But if you’re not in the mood to arrest people, it makes an awesome dune style buggy as well. Meet the Sky Car line. It can drive down your street at 30 mph or it can fly. Right now it has a flight limit of a couple hundred feet, but I imagine that will increase over time. Police departments and military purchasers already have orders in for these babies. The m400 will carry 4 passengers and the m200 will carry two. That is the only difference between them. I can see the m200 in my garage without using too much imagination. Well, first, I have to imagine that I have a garage and work from there. And, since I know you, here’s a link so you can buy direct from Moller. And what about Moller himself? What kind of dude is he? A pretty cool one if you’re an engineering geek. Paul S. Moller grew up on a rural chicken ranch in Southeastern British Columbia Canada near a town called Trail. At a very early age it became apparent that Paul had a natural ability and desire to engineer and construct things. When he was only 6 years old he began construction of his first house. His second was completed at age 9 and was a two-story – improving upon his first. So, am I pulling your leg or will this thing really fly? Watch the video to find out.